We featured tempescope several months ago. Now the visual weather station has been available for preorder via Indiegogo, but it must successfully raise nearly $400,000 before becoming reality. 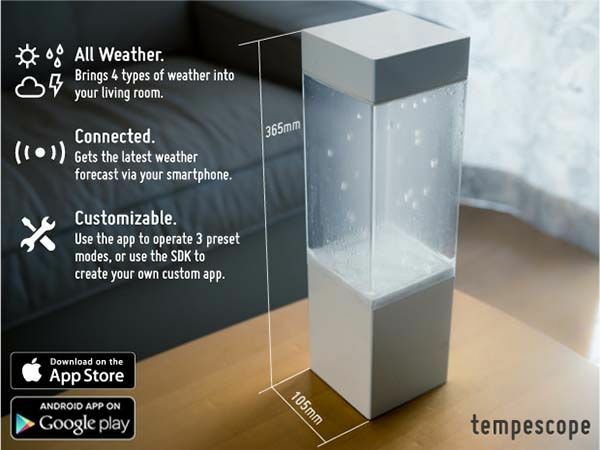 The Tempescope is a unique and pretty cool weather station that measures 105 x 105 x 365mm. As we can see from the images, the weather station shows off a simple and low-profile design in order that you can deploy your tempescope anywhere in your house, and its biggest transparent part shows you various weather conditions in a realistic way. 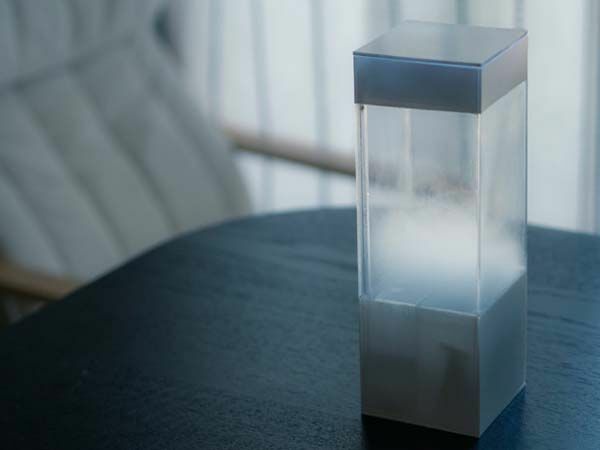 The weather station wirelessly communicates with your smartphone, and when you’re near your tempescope, its custom app automatically uploads the latest weather forecast to it so that the weather station can simulate the visual effect of real weather condition including rain, clouds, lighting and sunshine. In addition to forecast mode, the tempescope also features “sky sync” mode and manual mode. The sky sync mode allows it to sync to the current weather based on a geographic location set via the app, while the manual mode lets you force the weather station to show a particular weather or customize an animation sequence to play based on your mood. The tempescope has been available for preorder via Indiegogo. You can pledge $199 to own the tempescope developer kit. It will be shipped in April next year.